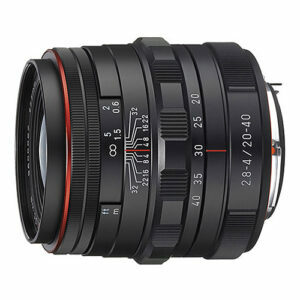 Lens Description: The HD Pentax DA 20-40mm f/2.8-4 ED Limited DC WR Lens from Pentax is a high performance standard length zoom lens for K-mount APS-C cameras. Its 35mm focal length equivalency is 30.5-61.5mm providing a versatile and practical range for wide-angle to standard length shooting. It is the first zoom lens in the Pentax Limited Series line and brings with it a durable, weather-sealed body, HD lens coating and an optical design consisting of one ED element and one super-low dispersion element. The f/2.8-4 maximum aperture enables effective low light shooting and, at the wide-angle end, control over its shallow depth of field for images that place sharp focus on the subject with a pleasing out of focus background. An in-lens direct current (DC) focus motor provides smooth and quiet autofocus action and its Quick-Shift Focus System enables rapid shift from autofocus to manual focus mode. The lens barrel and the included hood are made from high-grade aluminum alloy, distance and depth of field scales are clearly marked on the barrel and a smooth rotating, knurled ring provides manual focus control. SP (Super Protect) coating on the front and rear lens elements repels dust, water and grease to help maintain peak performance.